The Angel of the North is Britain's largest and most impressive sculpture. It stands near the A1 in Gateshead in the North East of England, marking the southerly entry to Tyneside. 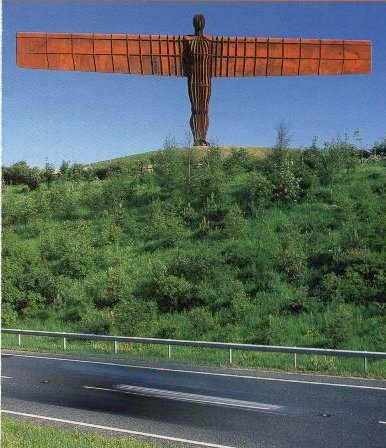 Commissioned by Gateshead Council, the angel was created by internationally renowned sculptor, Antony Gormley. It weighs 200 tons, stands 20 metres tall and has a wing span of 54 metres. The sculpture was made from two hundred tonnes of steel and has attracted world-wide attention since it was assembled on site in February 1998.